Come watch the LEE COLTS CLOBBER the Bayou Colts tonight! The last Varsity Football game is tonight at Bayou starting at 7:00. 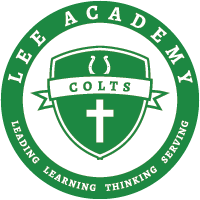 Please come out to support your Lee Academy Colts! Tonight is a BLACK-OUT game! FANS WEAR BLACK! Next Friday, October 28, Clarksdale Public Utilities will sponsor aCommunity-Wide Trick or Treat program from 3 pm to 5 pm. 30 students are needed to assist in passing out candy and guiding the children from station to station throughout the town. Sign up sheets for Key Club members and Builders Club members are on the Key Club bulletin board. On Halloween Day, the Key Club will sponsor a costume day. Bring $2, wear your favorite costume, and help us raise money for Unicef. Please be sure your costume is appropriate!